Moanalua's Tadd Fujikawa is the youngest player in 50 years to make a PGA Tour cut. LAKE BUENA VISTA, Fla. » Someone once told Paul Goydos he should go into the record books for his victory at the Sony Open for becoming the first player to win a PGA Tour event against a field that included a 5-foot boy and a 6-foot girl. One was Tadd Fujikawa. The other was Michelle Wie. Both are teenagers from Oahu who turned pro before they finished 11th grade and before they had a driver's license. Both have been criticized for giving up their youth. Neither of them has made a PGA Tour cut as a professional. "She's bigger than me -- definitely bigger," the pint-sized Fujikawa said with a laugh yesterday morning on the Palm Course at Disney, where he has received a sponsor's exemption at the tour's final event of the year. "Some people compare me and Michelle, but I don't think that's a true comparison. We're totally different." So totally different in so many ways. Wie's career was orchestrated, if not manipulated. She played 29 times against the pros before she became one herself a week before her 16th birthday. Her market value rose until she cashed in on endorsements with Sony and Nike, eventually Omega, and had a total income of about $20 million after one year. She signed a management contract with the William Morris Agency, known more for its Hollywood stars than golfers. Now in her freshman year at Stanford and rarely breaking par, some wonder whether Wie's best golf is behind her. Fujikawa also took the fast track, but he is starting slowly. The Children's Miracle Network Classic at Disney is his third sponsor's exemption this year. He missed the cut at the Reno-Tahoe Open and the Fry's.com Open in Las Vegas, only breaking par once. He missed the cut in two Nationwide Tour events. His last exemption of the year will be the Casio World Open in Japan next month. Yet, the kid is showing no signs of being discouraged. "Hopefully, within the next five years I can get my card," he said. "That's one of my main concerns. As long as I have that goal and stick to the plan, it should be fine. I don't want to rush into anything. It's tough. But I'm learning, and I'm definitely improving." If there is no rush, why turn pro? 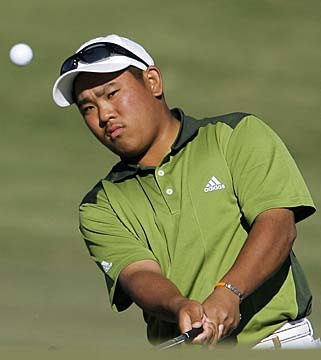 Fujikawa felt it was his best route to becoming a better golfer, not an instant millionaire. His mother works at an auto body repair shop. His father works in construction. It was a strain on the family for him to seek better competition, which means leaving the islands. "Financially, we're not that high up on the list," he said. He and his mother, Lori, spent a month on the mainland last year after the U.S. Open to play junior circuits. She brought a rice cooker from home and purchased a frying pan at a retail store, then found the cheapest hotel with rooms where she could cook. "I left the pan in the last hotel room we were in before going back to Hawaii," she said. This clearly was not a get-rich-quick scheme. Fujikawa was decked in Callaway garb at the Reno-Tahoe Open and wore Taylor-Made at Disney as he continues to test equipment. More than three months after turning pro, he still doesn't have an endorsement deal. His only earnings since he turned pro has come from pro-ams. "It's not about fast money. If it was, we'd have had that by now," said Kevin Bell, his agent and an attorney for Patton Boggs specializing in intellectual property and patents. "This is about wanting to further his golf career." If Wie's career was carefully planned, Fujikawa's was almost by accident. With most of the attention on Wie trying to become the first woman to qualify for the men's U.S. Open last year at Canoe Brook, Fujikawa became the youngest qualifier at age 15 when he won the sectional in Hawaii against a 10-man field. When they were on the same golf course in January at the Sony Open, Fujikawa stole the show. Four days after he turned 16, he became the youngest player in 50 years to make the cut on the PGA Tour, and the buzz didn't die until he finished in a tie for 20th. He followed that by winning the Pearl Open, where about half the field is comprised of Japanese pros. Suddenly, the attention and the temptation became too much to ignore. Friends of the family asked Bell if he could recommend an attorney, and with his workload quiet, Bell flew to Honolulu. When he met with Mrs. Fujikawa, she had an 8-inch stack of business cards from people wanting a piece of the kid. "She said, 'I've never needed an attorney my whole life,'" Bell said. The offers ranged from doing a PSA for a recycling company to making a special appearance an option. The first concern was making sure Fujikawa didn't violate his amateur status, but Bell sensed the boy wasn't long for amateur ranks, and that his parents knew it. "They were afraid to let him go pro," he said. "But they were equally scared of holding him back. He's mature about his golf game. He wants to be treated like a pro, and he acts like one." That his last PGA Tour start comes across the street from the Magic Kingdom is but a coincidence. Fujikawa looks like he belongs in line for Space Mountain, not on the tee trying to earn his first paycheck. Most players will take time to hit the theme parks. Fujikawa has math homework to finish. "I love Disney, but I'm not really into the parks," he said. "Besides, I'm here to work."